This post is being brought to you on behalf of Samsung through MomSelect. All thoughts, opinions and necessary drooling, are my own. It’s hard to believe that almost two weeks ago, I was in San Jose California living it up celebrating the 10th year anniversary #BlogHer14 style. It’s also hard to believe that even that far away, I was thinking about all of the great things that I would want for my home during the expo. Samsung had a booth dedicated entirely to home appliances and I was as giddy as a school girl. I remember two years ago, they had an entire home set up for Blog Her in New York City, but my mind wasn’t on all things house related like they are now. This is the world’s largest washer and dryer, with 5.6 cu. ft. washer capacity and 9.5 cu. ft. dryer capacity. 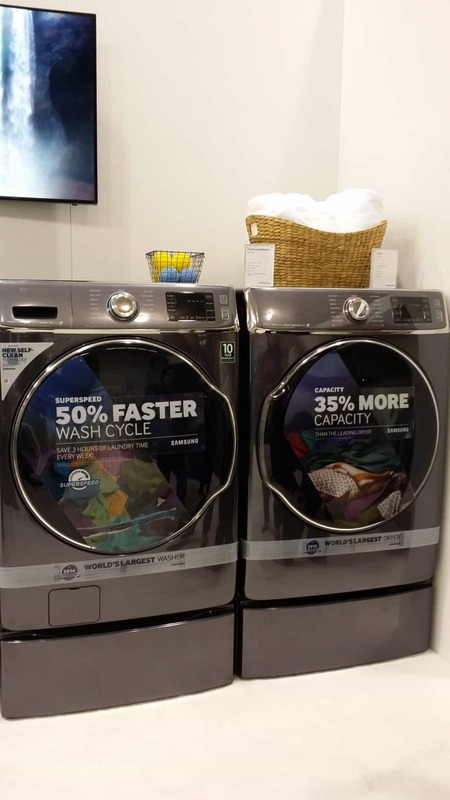 There is a SuperSpeed feature that you add to several wash cycles that makes your load time 50 percent faster, meaning a full load of laundry is done in just 30 minutes. PowerFoam™ Technology creates a powerful yet gentle foam that easily penetrates through fabrics which means there is confidence in washing even the biggest loads. The VRT® Plus Technology makes this the quietest washer in its class. It helps with vibration and noise reduction which not only keeps your load balanced but makes it perfect for upstairs laundry. A Steam Washer helps remove stains with limited pre-treatment, while a Steam Dryer means less time ironing and fewer trips to the dry cleaner. The dryer also has a Vent Sensor™ that detects problems and notifies the user when it is time to clean the vent. The washer also features Self Clean +. This cycle keeps your washer drum and the gasket fresh and 99.9% bacteria free without the use of harsh chemicals. These bad boys can fit two king size comforters in them to wash or dry. TWO. I mean, I don’t own a king size bed, maybe if I did, I’d only be two children in, but that’s water under the bridge at the moment. I loved being able to see it in action on the expo floor. The fact that this washing machine can steady itself and make it where there isn’t large amounts of bumping and thumping while washing is music to my ears. The fact that I can also program it to start at a certain time is even better. No more forgetting to do laundry all day! I loved how cozy the entire booth was, and they did have a refrigerator, stove, diswasher, purifier (for baby’s things) and microwave oven. It was like sitting in my own private Idaho. Wait. Basically, I mean it was heaven. I’m loving all things house related lately, which is amazing seeing that all things house related also seem to drive me crazy because there is so much to choose from. I shouldn’t be surprised that Samsung has found it’s way into my heart though. I’m a Samsung phone holder, and tablet holder, and television holder. It’s amazing. So now, to put away the duckets for all of the appliances I hope to squirrel into the house without Mr. Houseful knowing, but it won’t matter anyway, because I’m cutting down on his laundry time. Win, Win, right? Samsung products are the bomb. Have you seen the Samsung fridge with the built in Soda Stream…yes, a brand after my heart.